“So I was having a pretty good day,” dad Jesse Mab-Phea Hill began and readers instantly knew the sting in this Facebook post was going to be in the tail. Literally. Now blogging at Parenthood The Struggle, Jesse went on to describe his (ominously) idyllic morning. See. That was Jesse’s first mistake. Assuming that this calm was the kind of calm that does not come before a storm. Because let me tell you, a storm was imminent. A hurricane, in fact. Hankering for some chocolate cake, the oblivious and toddler-trusting Jesse headed upstairs to snaffle a piece. Spirits are high. He’s probably even whistling a cheery tune. But wait. What? His nostrils began to twitch. He has caught wind of something and it is not chocolate cake. Nu-uh. He soon realises the odour was coming from… upstairs. Shudder. This is playing the opposite way to a standard horror film, we realise, but it does not make what happens next any less terrifying. So, emerging from the basement, Jesse begins to… scream. Seems legit. There it is. The storm. It looks like poop. Denial seemed the appropriate first response. Surveying the scene, Jesse takes a sort of bolshy, tactical response team-type approach. 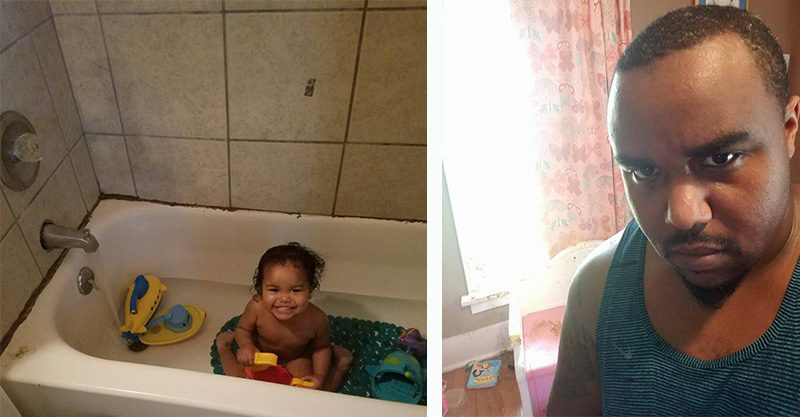 “There is literally no good place to pick my daughter up to get her to the bath, so I just knock the baby gate over so she can walk out on her own terms,” he explains. Alessandra stares at him, and glides eerily and poopily by, towards the stairs. Is she headed for the basement? Can she levitate? Did she say “Red Rum?” What will happen next? Gasp. Luckily, Jesse averts further crisis, realising that if he’s going to sort this out, he has to commit and GO IN. 20 minutes later, Jesse’s got Alessandra all tidy and poop-free. Crisis averted. But wait… PLOT TWIST… Jesse realises he has to clean her poopy room, too. Oh the humanity of it! “I haven’t even looked in her room yet because when I first got to her room Alessandra was standing there like a [poop] covered bridge troll,” Jesse explains. Once he peers inside, he realises it IS a horror movie, after all. Faced with de-pooping a DEFCON 1 nursery (see pics above), Jesse became disoriented and possibly distressed. “I have no clue where to start,” he admits, so he sends a distress signal to his absent wife, perhaps hoping to be rescued. Tick tick nope. Denied a life raft, he is forced to get on with the task at hand. “I won’t get into any more graphic details but 2 rolls of paper towels, 5 stolen gym towels, 1 bottle of pinsole, 1 bottle of bleach, 1 big bag of crap covered toys and 2 1/2 hours later her room still smells like a dumpster fire,” Jesse posted from the disaster zone, as he waited for his wife to arrive. “Alessandra is my favorite daughter but my 2nd favorite kid right now,” Jesse admitted as he signed off his update. We can’t say we approve, but we 1000 percent understand.